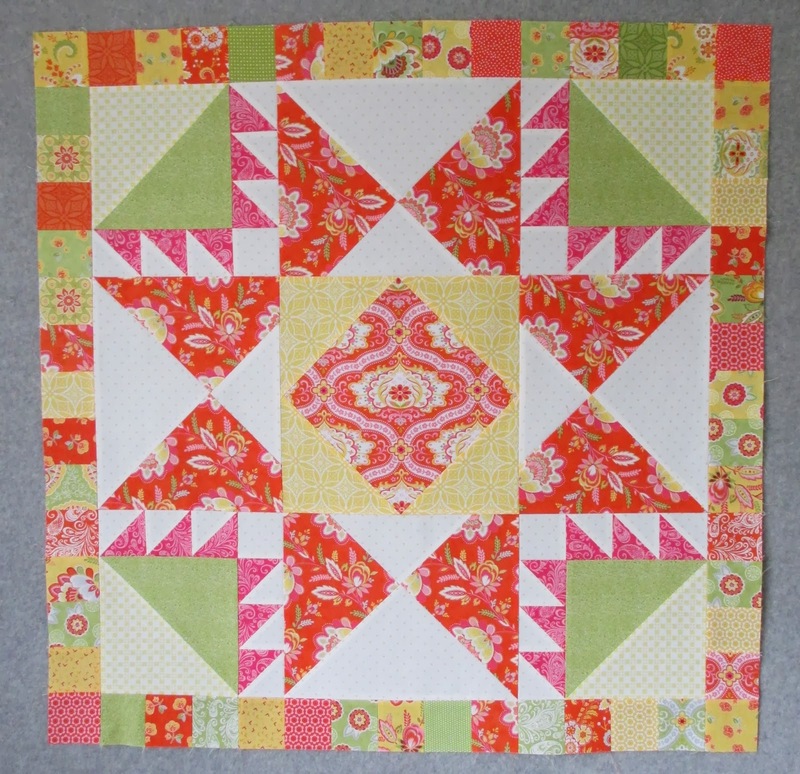 The first border of Summer Wind is made with just a few scrappy squares. They went together easily and I didn't have any fabric drama since I could use it all. The next border is made up of quarter square triangles. I used my Fit to be Quarter ruler to trim up these blocks. It makes this job so easy and the blocks squared up perfectly. I'm going with two pink fabrics for this border. 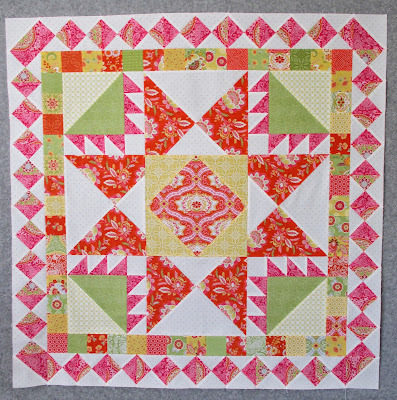 Does this quilt top make you want to eat Starburst candy? I've developed a craving for them. Here's the top with 2 of its 6 borders, so far so good! Tracey sent me a picture of her Summer Wind made using Martinique by 3 Sisters for Moda. I loved that line but didn't buy any. It was fairly different for 3 Sisters, I think some of the prints had shells on them. Anyway, Tracey thinks the pattern gets lost in the fabric, I don't think so at all, I love her version. Tracey even added two more borders to her top, I may do that too. I love this top and I love the High Street fabric line. I have already made one quilt with it and I may have to make this one. Makes my mouth water! What fabric are you using for your background? Looks like a white with an orange dot?? I like both versions. And I couldn't pick a favorite between the two! Yum my mouth is watering for Starburst! So bright and pretty! Yes, yes, yes it definitely reminds me of Star Burst candy. BTW my favorite candy. YUMMY!! 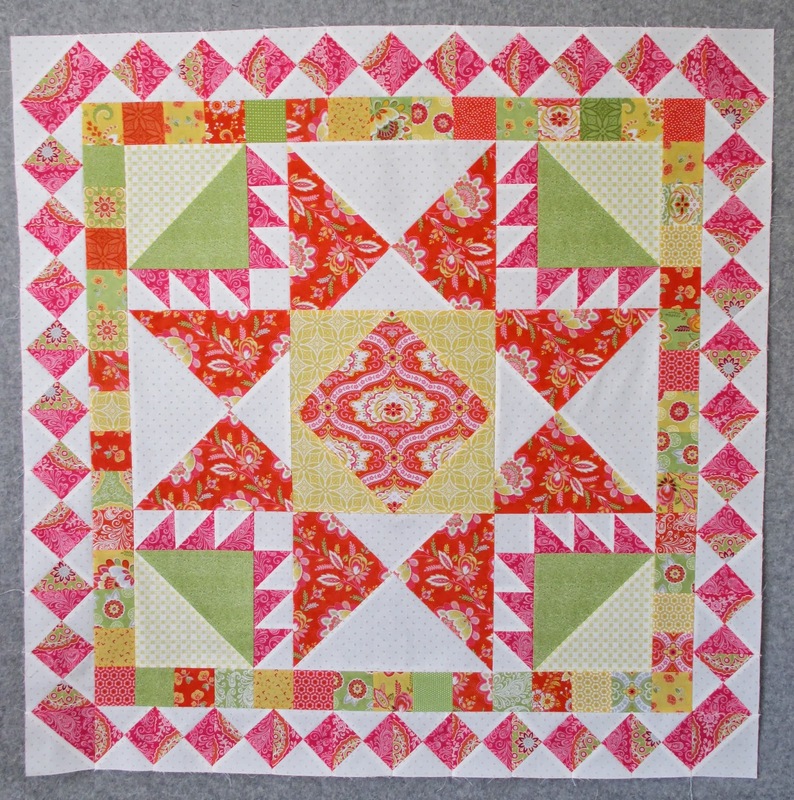 You might need to rename your quilt to include the word Starburst - maybe Summer Starburst? I can definitely see the Starburst part of it. It's going to be a really happy quilt! I lolled at "fabric drama" too! And I totally get the Starburst thing although I have a worse craving for that lovely line of fabric! 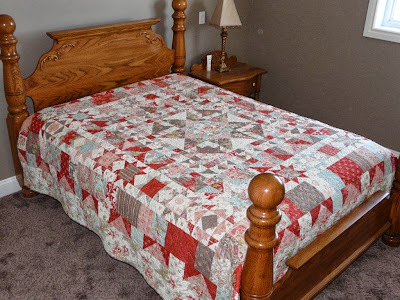 Thanks for sharing Tracey's quilt which I love... I think it looks wonderful in that 3 Sisters line. What a colorful & happy quilt ! Its gorgeous! Can't wait to see the rest of the borders! oh i'm so excited--i love Carrie's patterns, love your choice of fabrics! can't wait to see your finished top! This is quite nice and yes.....candy comes to mind when I look at it. 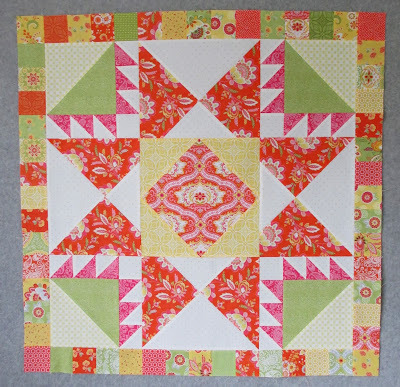 What a happy color combo and love this quilt too! Love both versions and now I want starburst candy too! It's been a while that I left a comment but I had to jump in and let you know how much I'm enjoying this one. I have Summer Winds on my to do list since Nicole's. I then caught sight of Camille's version and knew it was a must. "I take my coffee black"
A finish for us all . . . .